Today's 5 Ways to Wear is something that I have actually already posted about but I thought I would go back to it now it is summer - if you can even call it that - I will wear it differently to the way I styled it up for the winter. You can see the way I previously styled it here. 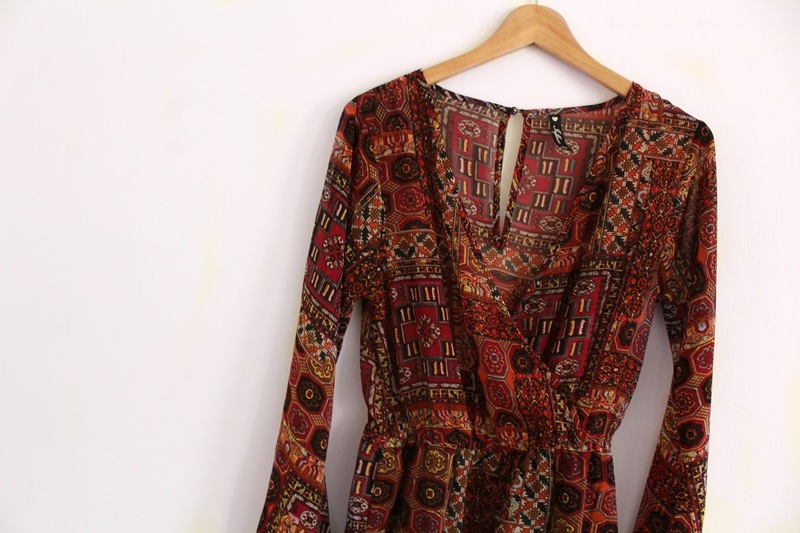 I have gone for a statement playsuit and not just plain one because I feel like I would pair up a plain playsuit a bit differently - maybe that will be a post in the future.. And I just thought this very boho orangey print is quite summery as well. It is from ASOS and I managed to snag it in the sale wooop! I love a playsuit because it can be worn is soo many ways and so many different looks can be made out of it - shorts, top or the obvious actual playsuit. And who doesn't want something that is going to be super versatile! Again I thought a playsuit was a pretty standard item of clothing that most people would have even if isn't a statement one or just a casual jersey one you can still work with the outfits I have made up and hopefully get some inspo for summer .. I really love this burnt orange colour - it was a massive favourite of mind throughout Autumn but I think its actually a really nice summer colour too. And I have just gone off and bought myself two new things in this colour. So be prepared for an orange overload. Are there any colours you are obsessed with this summer? What ways you would style a playsuit differently to me?